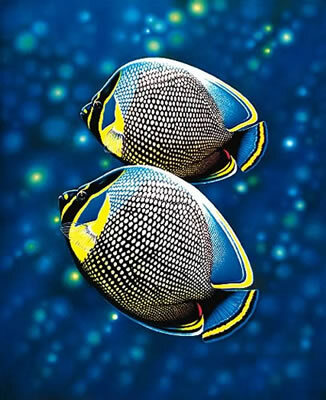 Pas de Deux portrays a pair of tropical fish known as Reticulated Butterflyfish (Chaetodon reticulatus). Of the many species of butterflyfish inhabiting the Hawaiian reef environment, C. reticulatus is one of the most ornately colored; it is also one of the rarest, found in only a few locations and seldom seen by divers. The title of this painting, Pas de Deux (dance of two, a ballet term for a dance with only two performers), is derived from the fact that Reticulated Butterflyfish almost always travel in pairs and are believed to mate for life. Inspired by a close-up encounter Alex had with a pair of these butterflyfish while diving, the painting evokes the sense of harmony and balance in our natural environment. This painting is one of the best examples of Alex's use of traditional watercolor techniques. The Pas de Deux Giclee is available on archival watercolor paper the same type of paper that he used for the original painting. For more information about this artwork, click here.